Once upon a time, somewhere west of Ireland there lived a beautiful young woman who was trapped in a mansion called Gaze by her raging husband. He was angry because she had had an affair and during a quarrel she had pushed him off a cliff. But he survived and went away leaving bodyguards and servants to assure she could never escape. The woman’s name was Hannah, backwards and forwards. She was golden-haired and golden-eyed and seemed to live in a golden world by the sea. But gold is neither good nor bad, but perhaps it is both – is that possible? Toward the end of seven years Marion, a new tutor/companion for Hannah, came to Gaze. Now living in the house at Gaze were Gerald the main bodyguard, Jamsie Evercreech his helper, Violet Evercreech Hannah’s secretary, Denis Nolan the business clerk, and some servants. The first part of the book is told. from Marion’s point of view. Across the way in a larger house called Riders lived Max Lejour a scholar of philosophy and his grown children, Alice and Pip. Effingham Cooper stayed there as he was Max’s student and Alice’s unofficial fiance. Max explained suffering, goodness, and free will to Effingham as well as some myths and wisdoms of his own. “Good” can only come from freedom, suffering can result in strength or something called “At,” an old Greek concept based on the passing on of suffering – not good. 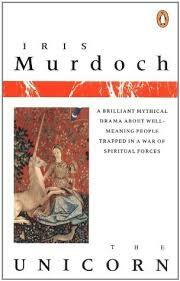 This is of huge importance to understanding the ideas Murdoch is exploring in the novel. Three times various characters tried to rescue (free) Hannah from her prison-tower. First Marion and Effingham tried. Then Gerald tried. Finally Pip tried. It never worked because Hannah didn’t want to be rescued – she was having a fine time as the suffering queen over all this bunch who loved her and their places under her enchanted spell of suffering. She pushes her suffering out on them. Is Hannah emblematic of good? Not really, she is an adulterous and murdering woman. Is she evil? How could someone evil create so much love and grace as life at Gaze seemed to offer? Hannah is both, backwards and forwards, good and bad, dark and light. And Gaze is a place of quite a lot of bloody violence, too. The other characters spin around and off of Hannah’s whims as well as their own. They love each other sexually, but are more likely searching for love – attached primarily to Hannah. Only Denis is pure, at least at first, even if his image is black, black clothes and hair, in shadows and night time. In the end, and it does end, I think the Hannah we meet is a only a myth, largely of her own creation, but also by the projection by the others. Like a unicorn with a golden horn, she is not real – nor does she particularly want to be. The thing which traps her, as it does the others, is guilt and suffering, hers and theirs. By midway through, they are all guilty of something and they all become physically and emotionally paralyzed in certain situations. Their own guilt traps them as it did Hannah and they learn to project their guilt onto others. Does Hannah escape her gilded cage? Can this self-made mythological creature live in the real world? Read the book – read it twice.